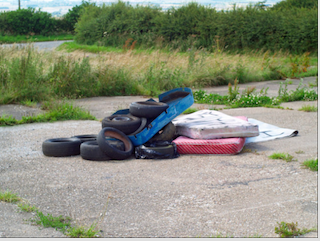 Fly-tipping as in this picture is becoming all to familiar within many country lanes, back alleys etc. We recently posted a blog regarding this subject but the occurrence of fly-tipping is becoming more and more frequent and further along in this story is CCTV evidence of what some businesses are willing to do rather than being legal. But why is this? You think just because it is rubbish you shouldn’t really have to pay a lot for it, so will go for the cheapest option, but have any of you really read up on just what it takes to recycle or control a landfill site for your well being, it’s enormous costing billions of money and endless amounts of time, all which have to be paid for. With social media you see people posting on how to save the eco system but when it comes to paying someone to clear their waste, for some reason morals and a conscience disappear. I suppose it could be ‘what they don’t see, doesn’t harm them’. But be very careful someone, somewhere is always watching CCTV is now around every corner. The Manchester Evening News publicised exactly what happens to you if you get caught. Keenan, 23, of Bosworth Street, Manchester, denied any involvement in fly-tipping at an interview under caution by town hall officers. A man who turned fly-tipping into a business has escaped jail. The footage shows Keenan collecting waste from the business owner’s residential address – the same rubbish which was later dumped on Sand Street. The business owner confirmed to council investigators that she had paid Keenan £120 to take this rubbish. At Manchester Magistrates he was given a 20-week prison sentence, suspended for 12 months. He was also ordered to do 200 hours’ community service, and pay court costs of £2,284. We can not always guarantee we will be the cheapest but can guarantee fly-tipping will never be our source of disposing of your waste, go to why use us for more information and our waste carriers licence.